A lot of people don’t realize this, but the spring actually is not the part of your garage door that does the most work. Without the spring, the garage door would have no prayer of opening. The spring is also what takes on most of the weight of the door. The opener applies a tiny amount of force by pulling a chain or belt along a track that is connected to your door. That’s why, when your spring breaks, it splits in two. It just can’t take it anymore! 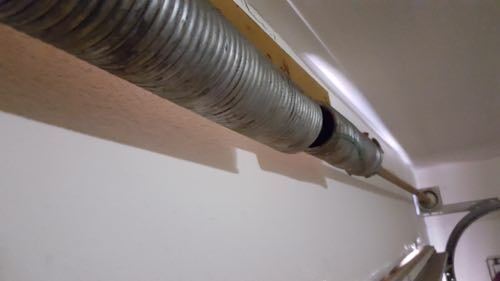 So, know that you know how hard your spring works to make your garage roll up and down every single day, it should be a little easier to understand why adjustments can help so much. Springs are tricky because you don’t want your spring to be wound up too tight or not wound up enough. They also always have a large amount of torque built up, making them extremely dangerous to work with for the inexperienced. To a pro on the other hand a spring adjustment is no big deal. They can be in and out in a matter of minutes, and on the same day you called. Adjustments will also save you hundreds of dollars, because you won’t have to pay for a new spring nearly as often. Okay, so how often should you adjust your spring? It depends on how much you use it, but if it’s being used twice or more a day then we usually recommend annual check-ups. If you’ve had a broken garage door before, you understand what a pain that is. Check-ups help make sure you don’t have to go through that nearly as often. Need proof? Let’s say you are 35 years old. We’ll put your lifespan as a homeowner at 80 years old. That’s 45 years as a homeowner. If a spring adjustment makes your spring last 6 years instead of 3 years, that means you’ll only need around 7 brand new spring installations instead of 15. If a spring installation costs $200 (ours are usually $189), then you saved $1600 minus whatever you spent on adjusting your springs. This won’t help with making sure your spring is not wound up too tight or not enough, but it will make it easier for your spring to move. Spraying your spring with White Lithium Grease every couple of weeks or even once a month does wonders for your spring. It helps reduce friction and thus reduces the amount of work your spring has to do. IMPORTANT NOTE: WD-40 is not the same as White Lithium Grease. What’s the difference? White Lithium Grease is a lubricant. You want a good lubricant for your spring if it is going to last. WD-40 is more for if you have a squeaky chair or car door. Although, White Lithium Grease is also known to reduce loud squeakiness of your garage door as well. Okay, let’s review. Garage door adjustments help make your garage door last longer. They take pressure off the spring (which takes on most of the weight of the door) and make sure it’s wound just right. You can also use White Lithium Grease to reduce friction, and make your spring’s job a lot easier. If you have any questions, need a spring adjustment, or new spring, feel free to give us a call!